Knowest thou the ordinances of heaven? Take a trip with me far back in time: to ice, and caves, and animal skins against the cold. The Sun dims, days grow shorter, trees and plants are dying, the berries gone. In a deep cave near a river hunters are gathered; a shaman chants, shaking and moaning, calling the spirits of animals that give life. The shaper dips his finger in charcoal-fat and makes a line, then another…a great aurochs sky-bull takes form, the stars in his head, the star-heap over his shoulder…the animals will come, they will give meat, and hides, and life. Taurus, the great Bull-in-the-sky, is an extremely ancient figure; the magnificent Lascaux cave paintings, dating from the Magdelenian epoch (17,000 – 15,000 BCE) show him as an aurochs bull (now extinct) with the characteristic tilted “V” of stars in his head and the Pleiades Cluster over his shoulder; when they were created, he was an Autumn constellation, rising and setting with the weakening Sun. Over millennia as the great wheel turned, the Bull came to lead the signs, rising with the Sun at the Spring Equinox, from about 4300 to 1580 BCE. In the Euphratean Valley, cradle of our Western constellations, he was called “Bull-of-Heaven,” “Strong Wild-Bull” “Great-Horned Bull” and “Bull of the Foundation” (the tilted “V” of stars in his head is the source of the Phoenician letter “Aleph” – our “A”)1. Although he no longer leads the signs, his awesome power is central to our experience of, and profound connection to, the sky. Jaspers, unaware, had chosen the time of a near-legendary (to us) and invisible (to them) conjunction of Uranus, Neptune and Pluto in the 6th century (500’s) BCE3 - could it be that this extraordinarily rare cosmic event influenced the human race to take a step out of its miasma of violence and chaos? Conjunctions of Neptune and Pluto occur every 495 years, i.e. twice in a millenium, but a conjunction of all three outer planets, Uranus, Neptune and Pluto, are so rare that only two have occurred since 5400 BCE!4 Tracking these conjunctions (both of Neptune-Pluto and of Uranus-Neptune-Pluto) then adding precession adjustments to find out where in the sky they occurred (that is, at what fixed stars), an astonishing pattern emerged: in the 7,000 years from the triple conjunction of 5036 BCE5 to the most recent Neptune-Pluto get-together in 1891-92, every one of the 14 conjunctions of the outermost planets has occurred in the stars of the Bull! What is there about this great, ancient sky-icon that makes it (apparently) a cosmic baseline for humanity? The bull is a complex totem, paradoxically combining lunar earth-mother and solar sky-father principles. Because its horns replicate the curved lunar crescent, it is associated with the Moon and thus with the moist, feminine powers of nature, ardor, seduction and the procreative urge. On the other hand its fertility, raw strength, rampant sexual power, brute force and the vigor of animal desire sweeping all before it are images of the masculine-solar generative force. Horns, too, are dual symbols: they are penetrating, thus active and masculine, and “crown” the head, thus are kingly; yet when broken or cut (used as drinking vessels, for instance), they are receptacles, which are feminine. In ancient times, a bull’s bellow was associated with thunder and the rumble of earthquakes, and, by extension, with God’s great gifts of rain and fertility, his divine punishments of violent upheavals, and withal a communicating link between heaven and earth. Is this the message – a link with the divine? 1st-century CE Roman astrologer Manilius (a contemporary of Jesus and Emperor Augustus), wrote “the Bull, chieftain of the herd, with Venus for his guardian, rejoices in the plough, endowing honest farmers with a source of labor in their peaceable lives; it lowers its neck, insisting on a yoke for its shoulders, awakening unplanted land to cultivation…or he carries rods of public office…abandoning his plough to become a dictator. Those born under the Bull have a love of unassuming merit; they take strength from a massive size that moves slowly” But the stars in the Bull’s head (the Hyades cluster, including royal Aldebaran, and the horns (now about 4 to 29 Gemini) come in for a very different, sharper interpretation: those born under them do not enjoy tranquility; they crave crowds, mobs and civic upheavals; riots and rebellion make them happy; they provide fuel for fears, and long for brawls which overthrow peace.” Here is a distinct description of the dual nature of the Bull – either quiet, pastoral, servile and sacrificial, or restless, aggressive, rebellious and dictatorial! The alignments with Rigel (Orion) and Al Ma’az (Auriga) bring in themes of aggression and militarism (in ancient China stars of Auriga formed “The Five Chariots” – a military encampment) but also, betimes, protection of the helpless (Tsan is a protector against marauders; Auriga carries a mother goat and her kids). Where, in all this, is there a clue to why these stars above all others have been “chosen” as it were, to carry a 3,945-year message10 to humankind? These are the dangerous, lowered horns of the rampaging Bull and the upraised left foot of the Hunter-Warrior, ready to come down in a cosmic stomp! Karen Armstrong’s remarkable research brings enlightenment: the religious-philosophical developments of the 6th Century BCE occurred in reaction to extreme violence! In each of the great empires of the time, a longing for peace, for relief from constant, unremitting wars, raids, destruction (and entrenched indifference to suffering) pulled priests, philosophers, scholars and common people as well towards a search for a better way, a path to peace and tranquility. Here, as well, are the stars of the concerned Charioteer, the Dove with an olive-branch in its beak, and above all, there is, at the conjunction, the powerfully-placed Venus, tutelary deity of the Bull. It is the Summer Solstice; the Sun, at the height of his heat and power, is in the Crab, home of nakshatra Pusya, “nourishment,” associated with prayer, speech and wisdom; its regent, Brhaspati, is the teacher-priest of the gods; Mercury, ruler of the 2nd of wealth and 6th of servants and military service (often enforced) is combust the Sun (nearly cazimi), blasted and blinded in his rays (or energized by them?). The Moon, in dignity, is actually at the Lion’s breast in nakshatra Magha, ‘The Great’ ‘Increasing’ ‘Bountiful,’ associated with brightness, majesty and power; this is the mansion of the Pitrs, ‘Fathers,’ maintained in heaven by offerings of their descendants; its symbol is a royal chamber containing a throne. Here at Lumbini the Great Conjunction is Rising, with Uranus caught in the tossing horns of the Bull (the precession adjustment to 2000 CE is +35° 57′); nearby Aldebaran, the Bull’s royal eye, co-rises. Venus, the Bull’s protector and guardian, dignified and exactly aligned with her own heliocentric NNode, escorts the three invisible outer planets, as if leading the way for them to follow; she lies at a cauldron of transformative energies and influences, just past the Bull’s horn-tips, in the “River of Heaven” (Milky Way) between Chi1 and Chi2 Orionis, at the tip of the Hunter/Warrior’s sword, aligned with Beta (Menkalinan) and Theta Aurigae in the Charioteer’s right shoulder and hand and, to the south, stars of Columba, the Dove; she is just entering nakshatra Ardra, “The Moist One,” whose symbol is a teardrop, ruled originally by Vedic storm-god Rudra, “the One who Weeps,” a fierce red form of Shiva who presides over destruction, procreation and transformation, suggesting that a calming, loving influence is approaching this difficult mansion. At Lumbini, constellation Aquarius culminates (27 Capricorn 36 adjusts to <3 Pisces 33>) (Lahiri 9Aquar 42), showing the MC to be Sadalmelik, the Alpha star of the Water-Pourer, at his Urn-bearing right shoulder; the MC also aligns with royal star Fomalhaut, “guardian of the south.” These stars bring forth people dissatisfied with with the world and with themselves; longing for utopia, they dive deep into the waters of religion or philosophy, searching for ideas of ideal communities and ideal forms of human relationships; longing for peace, needing to feel safe, many become reclusive. Gifted loners, they enjoy experimenting, creating, inventing and problem-solving; whatever field they enter, they will work to discover new means of improving the human condition. Dramatic, excitable, powerfully, stubbornly fixed in their beliefs, they may suffer for them. Intuitive, often psychic, they are keenly aware of the cruelties, sufferings and weaknesses of humankind. Serenity does not come easily to them; they struggle with cynicism and pessimism, and deal with issues of idealism versus expedience, sexual moderation versus excess, religious belief versus atheism, prejudice and violence versus non-violence and pacifism. Jupiter, the most elevated planet, at 22 Aquar 34 <28 Pisces 31> (Lahiri 4 Pisces 40) squares Venus; he is “at home” in the sensitive West Fish of Pisces, aligned with Azelfafage, Pi1 Cygni in the soaring Swan, and is retrograding back to the flow of water from the Waterman’s Urn (this position of Jupiter, at the 23rd degree of Aquarius, will turn out to be important in happenings flowing from this event); Saturn, ruler of the 9th, 10th and 11th at Lumbini, lies just above Antares, the Scorpion’s royal and warlike heart, near shaman Ophiuchus’ left foot; retrograde and setting; at the Dsc at Lumbini, he may represent the constant warlike pressures that challenge the serenity and peace of the realm; his solstice point is 24 Aquarius 23, conjunct Jupiter. Alas, we have no reliable date for Buddha, but I chose Lumbini (his birthplace), because of all the major philosophical figures born in the 6th century BCE, in many ways he epitomizes the extraordinary developments of his time (it is interesting, in this regard, that the conjunction was Rising at his birthplace!) For possible chart of Buddha, see Notes in red at end. For more than 25 centuries, major historical and philosophical advances and their leaders have tied into this ancient chart – warriors and peacemakers, the turbulent “upheavers” of history and the gentler souls who have raised humanity’s consciousness, from Alexander the Great to Gandhi, Tamerlane the Conqueror to Abraham Lincoln, have direct, exact links to this ancient Great Conjunction. Did the 577 BCE conjunction’s spiritual influence last beyond its own century? Edgar Cayce, under hypnosis, gave the birth date of Jesus as March 19, (the year given is not clear; 7 BCE is used, but 6 BCE is another possibility); (OS assumed, no time was given, 0 hour LAT used);15 the 577 Asc at Bethlehem was 3 Pisces, Jesus’ Uranus 3 Pisces (in stars of the West Fish); the 577 Bethlehem MC was 13 Sagittarius, Jesus’ Asc was 13 Sagittarius! Precession adjustment brings this to 19 Capricorn – Rho1 Sagittarii near the head of the Archer and strange, remarkable SS433 G Aquilae, an ancient supernova remnant in the wing of Aquila, the Eagle, which happens to be in the mysterious, rarely used intercalary nakshatra Abhijit (“Victorious”), ruled by Brahma, “under which the Gods conquered the Demons in battle.” These stars produce remarkable people with powerful, inventive, experimental intellects. 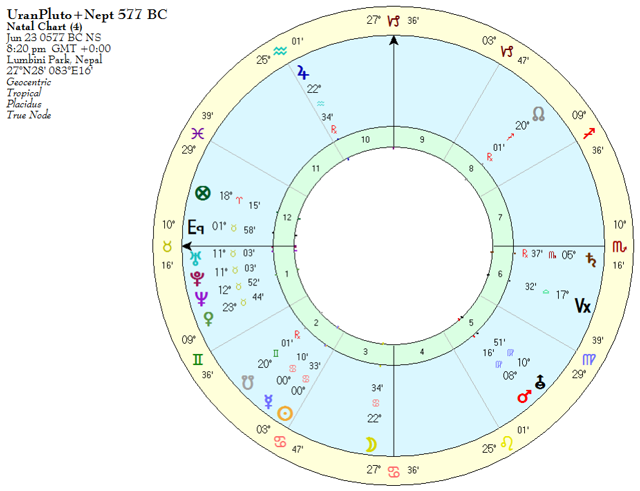 His Mercury was square the (then) heliocentric Nodes of Venus, his NNode at 10 Taurus (at the Bull’s head) conjunct the 577 Uranus-Pluto conjunction, his Pluto is on the 577 Mars (8 Virgo), and his Moon-Neptune conj at 5 Scorpio is conjunct the 577 Saturn (6 Scorpio) If this is truly the chart of Jesus, there are remarkable connections to the Great Conjunction 570 years before his birth! Most remarkably, when a 28º precession correction to the present is added to the MC, it comes out at the great star Spica, Alpha Virginis, the brightest star in the Virgin! The aggressive head of the Bull brings upheaval, disorder, chaos, violence – when it reaches an unbearable extreme, there comes the instinct to balance, to restore the center…but without his force and ferocity, there would be no need, no instinct, no impulse, to seek a better way. There must be darkness before there can be light…each of these great philosopher-avatars (and others, not mentioned) were born into times of upheaval, disorder and violence (the aggressive, warlike side of the Bull and Orion) in each case, people were suffering the collapse of previous religious and cultural certainties; times were hard – greed, cruelty, selfishness and arrogance dominated their environment; peace was attainable only by the extremely wealthy (and even they were sometimes helpless). Out of these severe conditions, as if summoned by the suffering masses, came great souls who labored to find new paths, to “sing unto the Lord a new song,” and to pass on their wisdom for future generations, It is remarkable that each of the 6th century BCE forerunners, none of whom had knowledge of the others, taught the same essential message: abandon selfishness, develop compassion, treat others as you would wish to be treated; eschew violence; learn, love others and yourself, understand that all of us are not separate, but one. These are still, after 2,582 years, radical, revolutionary ideals. We have a way to go. 2. Jaspers included Zoroaster (Zarathustra) whom he placed in the 6th century BCE, but recent scholarship makes the great Iranian prophet earlier, somewhere between 1,200 – 800 BCE, with 1,000 BCE as a rough estimate. 4: the span of reasonably accurate astrological computing can only extend back that far – beyond that, the slight differences in source computations throw attempts at exactitude into turmoil. 8. Staal, Julius D W: Stars of Jade; Staal, an astronomer and constellation expert, precessed a planetarium back to discover when China’s 4 great “mother” constellations matched the seasons they originally embodied; the result was 15,600 BCE. 10. 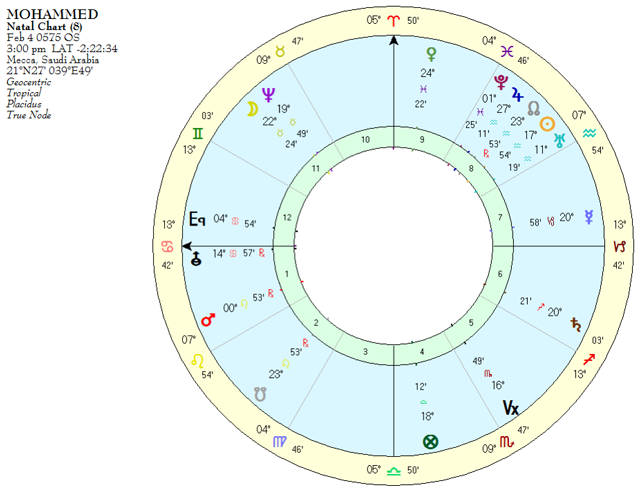 The next (triple) conj of Uranus, Neptune and Pluto (and a new message?) will occur in 3369 CE (3,945 years after the last one!) – in the Pleiades, the famous cluster in the Bull. 13. “Socrates was born in Athens in the fourth year of the 77th Olympiad on the 6th day of the month Thargelion, when the city is purified, according to Diogenes Laertius’ citation of Apollodorus’ Chronology.” http://gkonstantinou.homestead.com/socrates`ns4.html. Translating from the ancient Greek calendar is notoriously difficult – I am deeply indebted to Douglas Klovedal for his extensive research; he also chose a time, 4:20 PM LMT, which would put Socrates’ 399 BCE (death year) solar return Asc on the MC. 16. Date recorded by Al Biruni: “Monday, the Khur (11th) of the month Dai in the 41st year of Anushirwaf, at the beginning of the 7th hour, with the Sun in the liver of heaven and the Ascendant in Cancer” – from Rodden’s Astro-Data III, p 242 (but the date conversion given by Rodden was incorrect, as were the planetary positions). It is, of course, not possible to be certain that this is the correct date. 18. They arrived at sunset: July 16, 622 CE OS, 6:28 PM LMT, Medina, 24N28, 39E37; this is the foundation date-and-time of the Islamic Calendar. 19. Osama Bin Laden’s MC is 24 Aquarius (Mar 10, 1957, 10:58 AM, Jeddah, Saudi Arabia; from Interpol’s Wanted site. Note: the complex, long-range computations for this article could not have been managed without extensive, detailed help from Graham Dawson of Esoteric Technologies (Solar Fire) and Mark Pottenger (CCRS) – my heartfelt thanks to them both. 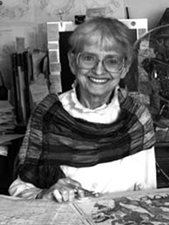 Bernadette Brady’s extraordinary Starlight program provided visual backup and affirmation of the calculations. Roebuck, Valerie J., The Circle of Stars. Shaftesbury, Dorset & Rockport, Maine: Element Books, Ltd. 1992. Note: In order to translate the 2000 CE tropical positions in this article (marked with angled parens: < >) to sidereal Lahiri degrees, add 6°09’ to each position, then go back one sign. 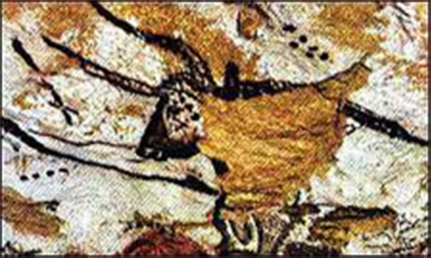 The 1st illustration is of Taurus, the Bull in a Lascaux cave painting of the Magdelanian epoch, ca 16,500 BCE; this is the earliest known depiction of a constellation; that it is specifically Taurus is indicated by the characteristic tilted “V” of stars in the bull’s head, the Pleiades cluster over his shoulder, and the nearby line of stars that form the belt of Orion. This Taurus is actually an aurochs, an enormous type of cattle once prevalent in Europe; the bulls stood 1.75 m (5′9″) at the shoulder, with horns up to 107 cm (42″) in length; in his Gallic War, Chap 6:28 Julius Caesar wrote “…those animals which are called uri…are a little below the elephant in size, and of the appearance, color, and shape of a bull. Their strength and speed are extraordinary; they spare neither man nor wild beast which they have espied…not even when taken very young can they be tamed.” The last surviving aurochs died in 1627. Discovered by four boys on the afternoon of Sept 12, 1940 in the Vézère Valley near Montignac, France (54N04, 1E10) as Uranus was transiting the constellation of Taurus, the Lascaux Cave contains magnificent Upper Paleolithic paintings of extraordinary skill and sophistication. A UNESCO World Heritage Site, it was open to the public from 1948 to 1963, but due to the effects of bacteria, fungus, algae, carbon dioxide and humidity, “Lascaux suffered more during those years than it had done in several millennia” and the cave had to be closed to the public. Due to a huge public outcry, the Departement of the Dordogne financed a 15-year-long painstaking reproduction of the most beautiful chambers, using the same colors and techniques of 17,000 BCE, “a work of art in its own right,” so that the paintings can be viewed by visitors; this “mock up” (called “Lascaux II”) receives about 250,000 visitors a year. At this writing the cave is in crisis once more, with a second fungal invasion one expert called “appalling.”. It is not yet known whether a tragedy can be averted. 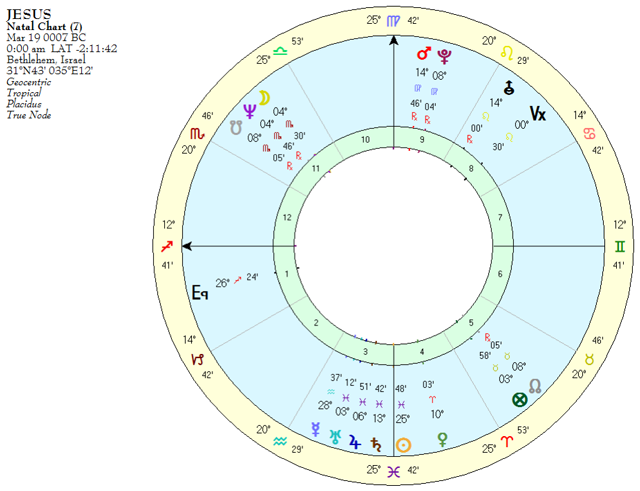 The triple (near) conjunction that preceded that of 577 BCE was February 3, 5036 BCE NS, 2:50 AM GMT; the closest they got at that time was 5°25′: Uranus and Pluto were 11 Aquarius 33, Neptune 16 Aquarius 58; they were placed at the stars where the the Bull begins (precession correction to 2000.0 is +98°09′). Mercury was in the head of the Bull, Venus in the head of the Ram. According to archaeologists, this was the epoch of the earliest known farming communities. IN EARLY 2010, ALMOST 4 YEARS AFTER THIS ARTICLE WAS WRITTEN, I DECIDED TO ATTEMPT A CHART OF BUDDHA. A WIDE VARIETY OF YEARS IS GIVEN FROM AS MANY SOURCES; ONE OF THE MOST FREQUENT IS 563 BCE. 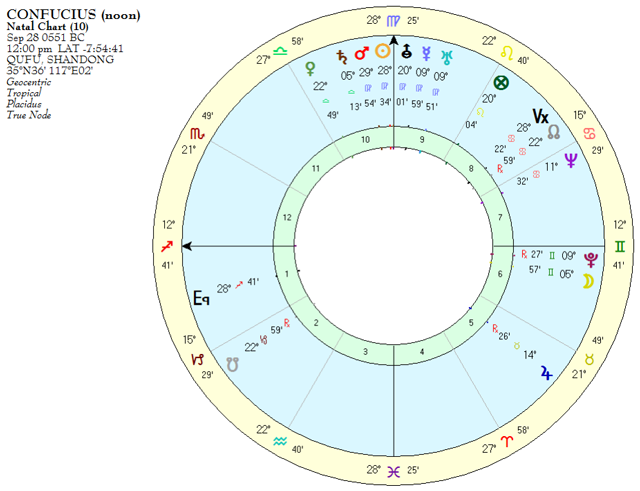 BECAUSE OF THE VERY STRONG TRADITION THAT HE WAS BORN ON A FULL MOON IN MAY, I RAN A CHART FOR THE EXACT FULL MOON OF MAY 11, 563 BCE, AND CAME UP WITH 6:50:55 GMT (12:31:42 PM LAT, 12:24 PM LMT), LUMBINI, NEPAL, 27N28, 83E16: Asc: 23Leo14; MC 20Tau43; Sun: 12Tau56, Moon 12Sco56, Mercury 22Ari24, Venus 26Gem31; Mars 11Ari06, Jupiter 23Ari18; Saturn 29Ari43; Uranus 7Can59; Neptune 11Gem23; Pluto 24Tau03; true NNode, 22Pis51, mean NNode, 21Pis20. Precession correction to 2000: +35°44’ (See tropical chart below). SINCE THE GREAT CONJUNCTION WAS RISING AT BUDDHA’S BIRTHPLACE, IT OCCURRED TO ME, FOR A LECTURE AT THE UAC (UNITED ASTROLOGY CONGRESS) OF 2008, TO CALCULATE THE OTHER PLACES IN THE WORLD WHERE THE CONJUNCTION WAS ANGULAR: IT WAS SETTING AT PHILADELPHIA, NEW YORK AND WASHINGTON DC, AND ANTICULMINATING AT LONDON AND PARIS (IT WOULD HAVE CULMINATED IN THE PACIFIC OCEAN). 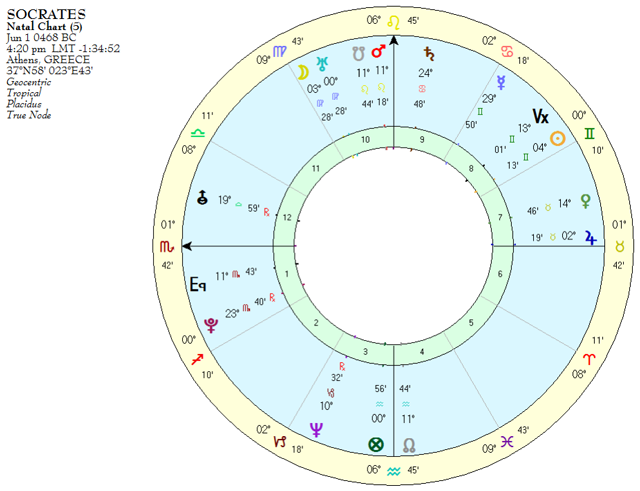 BETWEEN THE CHARTS: March 19, 7 BC NS would have the Moon at 3 Sag 12 in the 12th, Asc 14 Sag 12, MC 27 Vir 39.